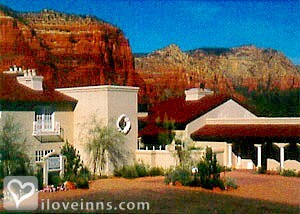 Grand Canyon bed and breakfast travel guide for romantic, historic and adventure b&b's. Browse through the iLoveInns.com database of Grand Canyon, Arizona bed and breakfasts and country inns to find detailed listings that include room rates, special deals and area activities. You can click on the 'check rates and availability' button to contact the innkeeper. Every time Arizona is mentioned, the next thing that comes to mind is the Grand Canyon. This is understandable since the Grand Canyon has long been considered the state's most distinguishing landmark. Grand Canyon area bed and breakfast innkeepers will give guests great "how tos" and tips to visit the South Rim, Toroweap Point, and Lipan Point. The waters at Havasupai Falls are truly refreshing although the sight alone is already exhilarating. Hiking along the South Kaibab Trail or the Bright Angel Trail is both fun and challenging. The same can be experienced at Tonto Trail and Cape Royal Trail. Historical sites can also be found in the area. This includes the Historic Navajo Bridge. Going to the Western Discovery Museum is learning history with the use of the most modern and sophisticated audio-visual technology. By The Dumplin Patch Bed and Breakfast. The Grand Canyon has become synonymous to Arizona. This amazing landscape is actually carved by the Colorado River. Much of the area has been included in the Grand Canyon National Park. Among the most visited sites within this national park are the Ancestral Puebloean granaries which are located near the Nankoweap Creek. Eagle Rock, on the other hand, is one of the most photographed because of its unique geological formation. Another most photographed part is the Grand Canyon from the South Rim. The Desert View Watchtower, Hopi House, Buckey O'Neill Cabin, and Lookout Studio are just some of the few man-made attractions in the area. Grand Canyon area bed and breakfast inns are located nearby. By Grand Living Bed and Breakfast.